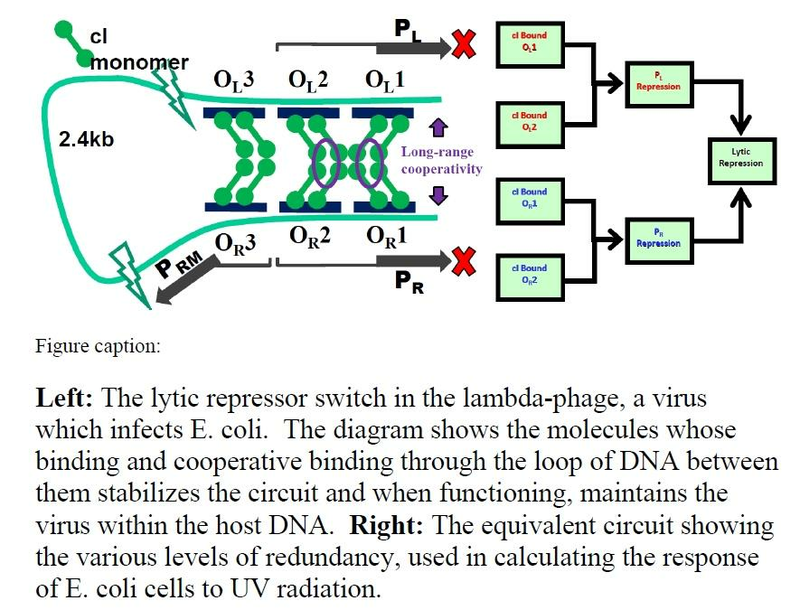 When a virus attacks a cell, such as the bacterium E. coli, it uses its genetic material (DNA or sometimes RNA) to hijack the host cell and thus to replicate itself using the host cell machinery. In microbial cells, a virus can make a hundred or more copies of itself, before rupturing the host cell and escaping to infect more cells (in plants and animals the escape does not usually result in cell destruction). But some viruses are less violent in the way that they infect microbial cells. Instead of immediately replicating within the environment of the cell, they insert their DNA into the host chromosome, where it lies dormant as the cell goes about its life-cycle events. Indeed, as the cell reproduces and makes a copy of its chromosome, the dormant virus DNA is copied with it. Cells that have an intact copy of the viral DNA within them are often known as lysogens. And in essence, they are carrying within them a viral time-bomb: for if the cell experiences some form of stress, such as starvation or radiation, the virus is able to initiate the sequence of reactions that result in the escape of multiple copies of the virus and the destruction of the cell. To understand in detail the way the viral time-bomb is triggered, Nigel Goldenfeld and Ido Golding, together with postdoc Nicholas Chia, teamed up to analyze the biochemistry of the DNA trigger circuit, and to test their theoretical analysis with laboratory experiments. The novelty of their approach was to regard the biochemistry as if it was a network, rather like that found in an electronic circuit. The circuit operates as a sort of failsafe: while the circuit runs, the viral DNA is maintained within the host chromosome. They discovered that when the cell encounters strong enough ultra-violet radiation, the double-stranded DNA is damaged, activating a cellular repair response. A side effect of the cell’s efforts to repair the damaged DNA is that the machinery that holds the viral DNA in place begins to fail. The researchers identified four levels of redundancy in the circuit, and were able to calculate and measure the fraction of cells whose viruses were not activate as a result of the radiation damage. The theory compared well with direct experiments, and in addition made a number of other predictions that are consistent with observed trends, and which can be tested in future work. The approach that was used in this study should be capable of being applied to many other situations in living cells, where one wants to understand the entire cell response to changes in its environment. This work was published in Physical Review E, Rapid Communications in September 2009.